When you learn how to make a pecan pumpkin pie recipe you will probably find a recipe in any southern cookbook you pick up. Both the pumpkin and the pecan tree are native to North America. Many uses for the pumpkin were learned by our first settlers in the original colonies as soon as they arrived. The Indians showed the colonists the pumpkins and how to cook them. There is some evidence that the idea of Pumpkins being used as a pie filler came to the United States along with more early settlers. When I learned how to make a pecan pumpkin pie recipe I found that it was not a traditional Thanksgiving recipe unlike a basic pumpkin pie was. As our country grew, the production of pumpkins did also; now being grown in most parts of the country. I do not know as fact, but I would say the first pecan pumpkin pie came later. Although both the pumpkin and pecans are native to the United States, I can find no documentation to show the two being put together in a pie until the twentieth century. There were wild pecans growing when the first pilgrims arrived in the New England colonies but they were sparse and considered a delicacy. In the late eighteen hundreds is when the commercial growing of the pecans began. Today, the United States produces almost all of the world’s pecans. This is done in many of the southern states; Georgia being number one; some other states being Texas, South Carolina and Arkansas. As I was learning how to make the pecan pumpkin pie recipe, I assumed that the abundance of pecans produced here is what brought about this recipe. There is evidence that the French immigrants that settled in Louisiana developed the first pecan pies in the eighteen hundreds. I can find no documentation of pecan pumpkin pie recipes before the nineteenth century. After that, they are recorded in almost every cookbook you read. 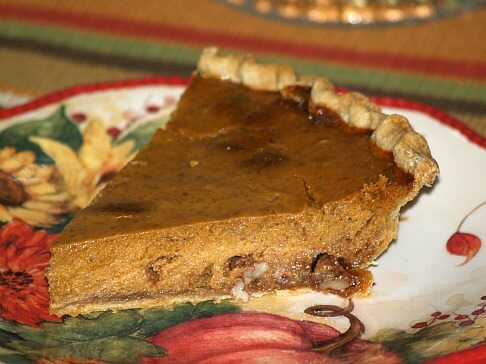 If you pick up a Southern cookbook, especially one from the state of Georgia or Louisiana, it is guaranteed to include a pecan pumpkin pie recipe. Cream butter and 2/3 cup brown sugar in small bowl; blend in pecans. Spread evenly over bottoms of pie shells and press down. Bake for 10 minutes; remove and cool. Turn heat down to 350F degrees. Combine milk and water in a saucepan. 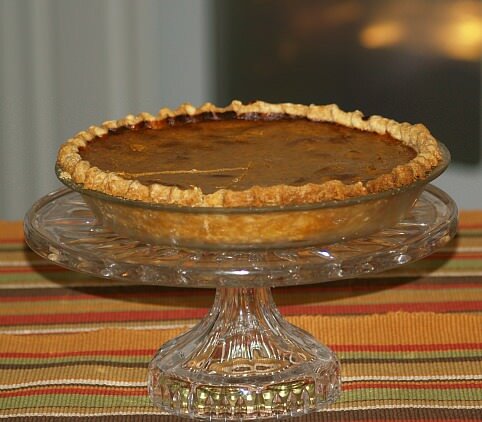 Beat eggs in a large bowl; stir in pumpkin, sugar, ½ cup brown sugar, pumpkin pie spice and salt.Beat in the milk mixture; Pour mixture into cooled crust. Bake for 50 minutes; Custard will set as it cools. Cool completely and serve with whipped cream. The following pumpkin pie recipe has coconut added to the pumpkin and pecans for additional flavor. Combine in a large bowl the brown sugar, cinnamon, nutmeg, salt, flour, coconut and pecans. Combine and mix together the pumpkin, eggs and milk; add to the dry ingredients and blend thoroughly. Pour mixture into prepared pie shell and bake for 10 minutes. Reduce oven temperature to 350F degrees. Leave in oven and bake an additional 30 minutes until custard is set. For filling combine pumpkin, apple butter and butter in large saucepan. Cook and stir over medium until butter melts; remove from heat. Stir in ¾ cup brown sugar, granulated sugar, flour, cinnamon, ginger, salt and cloves. Combine eggs, evaporated milk and water; stir into pumpkin mixture gradually. Pour mixture into crust; bake at 450F degrees for 10 minutes. REDUCE OVEN TEMPERATURE TO 350F degrees; bake 30 minutes longer and center is almost set. For meringue, combine 1 tablespoon granulated sugar, cornstarch and cold water in a small saucepan. Over medium heat cook and stir until mixture is clear; let cool. Combine egg whites and ½ teaspoon vanilla in small bowl; beat on high until frothy. Beat remaining 3 tablespoons granulated sugar gradually into egg whites; beat to soft peaks. Add cornstarch mixture and beat 1 minute on high speed. For praline topping combine 2 tablespoons brown sugar, corn syrup, butter and vanilla in small saucepan. Cook and stir over medium heat until butter is melted and mixture is blended; remove from heat. Spoon dollops of meringue around outside edge of pie; sprinkle nuts in the center. Drizzle topping over the nuts; bake at 350F degrees for 15 minutes or until meringue is golden. Cool completely before serving; refrigerate leftovers. TO MAKE FILLING combine pumpkin, evaporated milk, eggs, sugar, cinnamon and salt in a large bowl. Stir pumpkin mixture until smooth and creamy; pour into unbaked pie shell. TO MAKE TOPPING combine flour, brown sugar, butter, cinnamon and salt; mix to coarse crumbs. Stir in chopped pecans and spread over filling; bake 45 to 55 minutes until knife inserted in center comes out clean. Cool to room temperature; garnish with whipped cream and pecan halves to serve.